On a rainy night in Goshen, all eyes were on Zack Foley as the senior guard was only ten points away from scoring 1,000 points in his Goshen career. Foley got to the milestone, but it was no easy task as a stout defensive group from Monticello tried their best to limit the Gladiators’ leading scorer. The hype surrounding the achievement did not overshadow the team’s main goal, which was to get another division win. They did just that, narrowly defeating Monticello 57-55. The pace of the game was definitely slow to start, as Goshen trailed the Panthers 13-8 after the first quarter. Foley started out slow as well, only scoring two points until the closing seconds of the second quarter, in which he hit a step-back three-pointer that gave the Gladiators the lead going into the second half. In the second half, the game definitely began to take shape and both teams began to play quicker and get more shots. It was a back-and-forth affair though, as neither team could secure a comfortable lead. Although the Gladiators were struggling to grab defensive rebounds in the second half, their defense close to the basket was just enough to keep the pesky Monticello group from gaining the edge. The Panthers had a chance with seven seconds left to tie the game and force overtime, or shoot a three and go for the win, but the harrassing Goshen defense forced a tough layup to rim out. Even though the Gladiators could not secure the rebound, a blinding closeout forced a last-second jumpshot to miss the mark and Goshen earned another division victory to improve to 8-2, (3-1 in Division III). The Gladiators were led by Foley, who surpassed the 1,000 point milestone, with 18 points, eight assists, and seven rebounds. Junior Matt Giordano was a strong contributor with a double-double of 11 points and 13 rebounds. Eric Romero, who has been in a shooting slump as of late, did whatever he could to help the team pull out a win as he finished with nine points and 11 rebounds. That’s the mentality everyone on the team must have going into the second half of the season. Not everyone on the team is a prolific scorer who can get a bucket at the snap of their fingers, so at this point, it is about effort and energy. When the energy level is high, this team becomes nearly unstoppable. The matchup for Goshen was one that they have had troubles with this season. Monticello wasn’t a very tall group, but they were athletic, long, and tough-nosed defensively, which can give the Gladiators problems at times. Definitely a lot of credit should be given to the Panthers for how they played Tuesday night. They forced Goshen into 22 turnovers and were plus-22 in the offensive rebound margin, winning that battle 31-9. Standout junior wing Josh Gattling was a menace defensively, matching up with senior guard Zack Foley and limiting him to just 12 points before earning his 4th foul. Gattling finished the game with 12 points and eight rebounds. Foley became the fifth boy in Goshen Basketball history to score 1,000 points, joining Izett Buchanan, Rudy Charles, Chris Cook and first-year varsity assistant Ian Schupp. 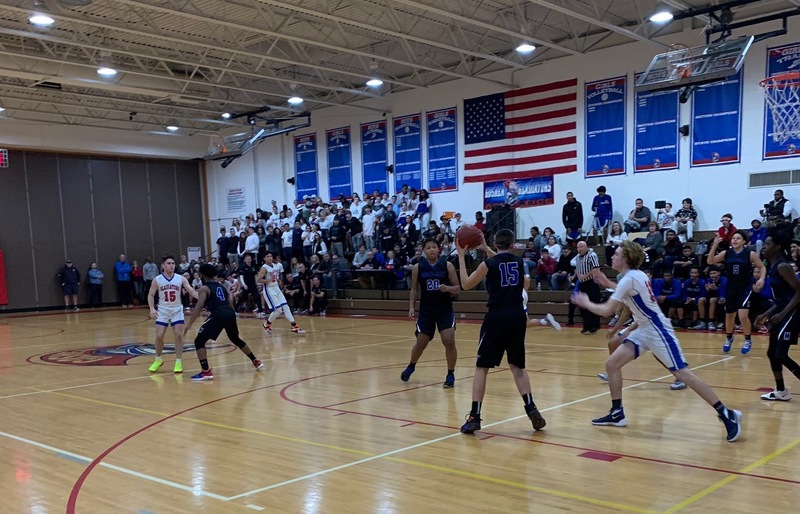 Goshen faces its toughest test of the season next Saturday, going up against a 10-0 Washingtonville squad in the semi-finals of the Jim Taravella Tournament at Monroe-Woodbury High School. The Gladiators look for a statement-win after losing 63-28 to the Wizards last season. Authors Note: As a longtime friend of Zack Foley, I would just like to congratulate him on a historic achievement. You’ve earned it, kid. Enjoy it, though there is a lot more work to be done. Foley (Left) & Tyler Smith (Right) after Foley scored his 1000th point.